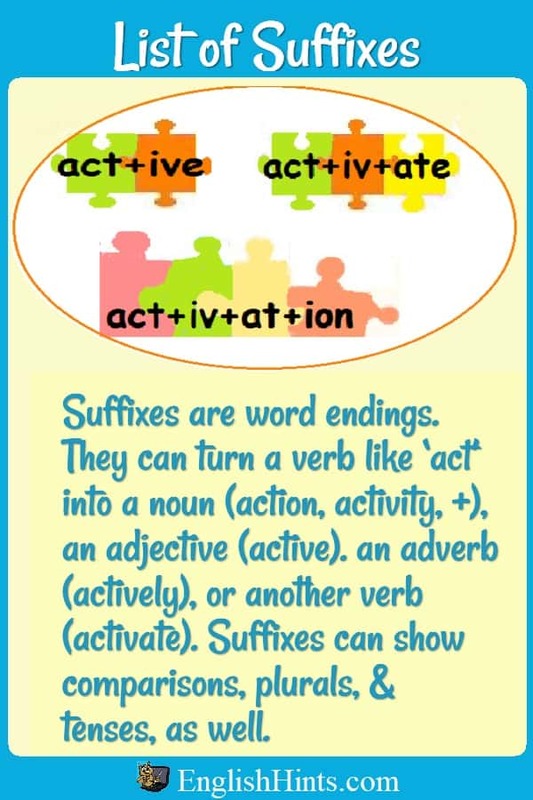 Use this alphabetical list of suffixes to find information about the meanings and uses of different word endings in English. Suffixes show where to use a word in a sentence, when something happened, whether there are one or more things, etc. Some suffixes identify nouns, adjectives, adverbs, and verbs. Other common suffixes show tenses, plurals, and comparisons. 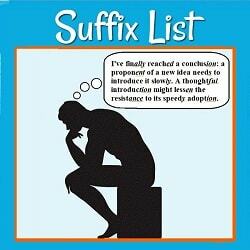 To keep this page from being extremely long, explanations of suffix types and a grouping, by type (plus more examples) have been moved to Suffix List Arranged by Use. The links to each section in the list will take you to the correct part of that page. Several suffixes have two listings because they have more than one use, and some of the listings actually cover two related uses. For example, -en is an irregular past participle ending for verbs like to eat and to write. Those past participles can also be used as adjectives (a half-eaten apple or a written test.) 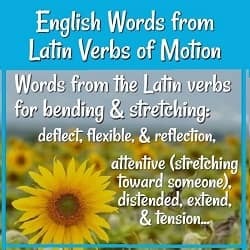 -En can also be added to nouns or adjectives to make them into verbs: to brighten, lengthen, straighten, or whiten. When you know these word-building suffixes, you can guess the part of speech (the role) of a new word, and how to use it correctly. Study the examples below. If any words are new to you, do you recognize any parts? Can you figure out their meanings? If you know that the English suffix ‘-ity’ is like the Spanish ‘-idad’, or ‘-ify’ like “-ificar’, you can recognize many other words with the same suffix. (Do remember that the way we use the words in English may be different, though the basic sense is usually similar.) Watch for examples of other cognates below. The list of suffixes is right below these links. Note: All the suffixes labeled 'Aj' make words into adjectives (or show that the word is an adjective). The 'Adv' suffixes mark adverbs, 'Ns' mark nouns, and 'Vs' mark verbs. Their meanings are discussed in each section. CP suffixes are used for adjective comparisons, and PT suffixes for plurals of nouns as well as for tenses (past, continuous, and the third person singular of the present tense). Again, for a more complete explanation see each section on Suffix List. If you want to teach suffixes (alone or along with prefixes and roots) there are several helpful pdf lesson packets on the Root, Prefix, and Suffix Worksheets page. Packets include the information from this and other pages, as well as teaching suggestions and games. The basic suffix packet is free; the complete one or combination bundles are inexpensive-- and have lots of time-saving teaching ideas. The organization needs money, so they will organize a fund-raiser. Mary should plan it; she’s the most organized. 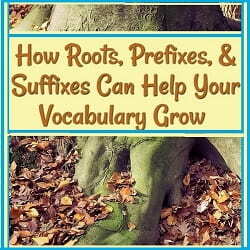 Be sure to check out Word Families for an explanation of how roots, prefixes, and suffixes work together and the parts of speech formed by different suffixes. Do you wonder what a prefix means? 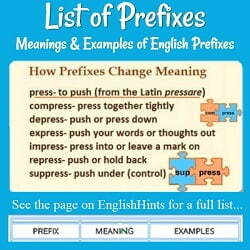 Check out this alphabetical listing of about 50 of the most useful English prefixes, with their meanings & examples. This suffix list, arranged by part of speech, shows the way changing the suffix changes the way a word can be used in a sentence.